Since starfish aren't fish, scientists prefer to call them sea stars (Asteroidea). Unlike fish, they don’t have gills, a spine or a brain. Their blood is filtered sea water. Sea stars are prehistoric in origin, and were once thought to be simple creatures that didn’t interact or communicate. Researchers have now discovered they're more complex than originally thought. Sea stars are echinoderms. These are invertebrate marine animals with a series of calcium carbonate plates underneath their skin, giving them a calcified or spiny surface. Sea stars have arms, or rays, that grow out similar to spokes on a wheel. On average most sea stars have five arms, but they can range up to 24. Although sea stars don’t have brains, their noncentralized nervous system gives them a sense of all that is around them. Their sensory cells not only inform them of water currents, but also detect touch, light and chemicals. Sea stars have hundreds of tube feet, or podia. These tubes run throughout the undersides of their bodies and arms, and they're dense with sensory cells. Depending on what they feel, they may use them for gripping or movement, or to locate food. Sea stars are slow moving, but a time lapse film by biologists Don Wobber and John Pearse shows how they use their arms to interact with each other on a regular basis. They touch each other as if getting a sense of the others size, and often wrestle for a position of dominance over territory. The tube feet of sea stars are receptors in many ways. They also help to pick up chemical changes in the water. Sea stars don’t have noses to smell, but their nervous system detects smell-like changes within their surroundings. They use these odors for prey detection and predator avoidance. If attacked by a predator, certain sea stars can let an arm drop off, sending out a chemical alarm to other sea stars in the area. The adult pheromones of some species will trigger metamorphosis in larvae. On the tips of their arms, sea stars have groups of cells that detect light. These are known as eyespots. They cannot see the way humans do, but these eyespots help give them get a perspective of environments and movements. The direction of light tells them which way is up, or gives them an idea as to what is ahead of them. A sudden blockage of light may be a warning that an enemy is nearby, or perhaps another sea star is approaching for a battle of dominance. Does a Jellyfish Have a Brain? What Is the Difference Between a Sea Nettle & a Jelly Fish? What Are Starfish Covered With? What Are the Traits of a Dolphin? What Are the Fuzzy Things on a Jellyfish? 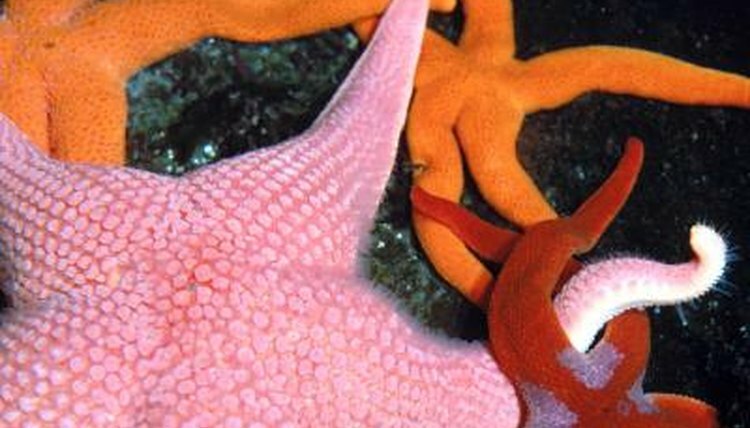 What Are Unique Features of a Starfish's Physical Appearance?